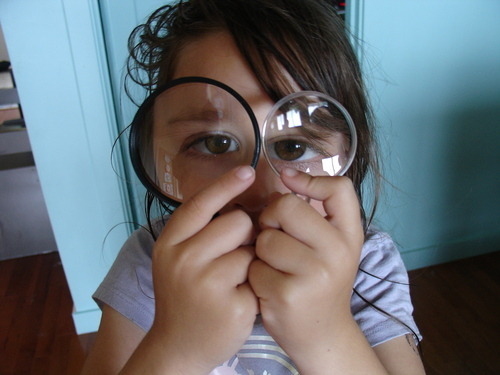 During January, National Eye Care Month, start the new year by looking into your child’s vision. According to the Vision Council of America, nearly 50% of parents with children under 12 have never taken their children to an eye care professional. Typically parents know to schedule a traditional eye exam, which involves testing vision by reading an eye chart. However, there are also symptoms that can be signs that other healthcare providers could address due to the negative effects on academic, emotional, and life skills. Beyond visual acuity, which measures the clearness of vision, a child could also have deficiencies with visual perception and visual motor skills. Visual perception includes skills that determine how well a person understands what is seen specifically with skills including memory and discrimination of forms such as shapes, letters, and numbers. Visual motor skills include how well the muscles around the eyes coordinate to control eye movement. If your child demonstrates these symptoms, consult with your primary care physician about seeking an evaluation with a pediatric occupational therapist or developmental optometrist. I hope you find these tips helpful. Have a playful day! The holidays are quickly approaching, and parents have toy buying on their minds. With the fast-paced advancement of technology, gift giving has become an expensive and overwhelming process that seems to generate more anxiety than joy to the world. Parents want the best for their children and are willing to purchase the newest products, but sometimes simplicity is superior. Numerous studies have shown that the increased use of technology has resulted in a decline in critical thinking and cognitive skills, attention span, and the ability to self-regulate. In addition, the use of technology in small children can limit the time spent using their hands in ways that develop the muscles needed for skills like handwriting and shoelace tying. In fact the late Steve Jobs, founder of Apple and the visionary behind the iPhone and the iPad, understood that fostering a young child’s creativity and imagination involves also limiting time with technology. He was known as a low-tech parent as are many tech executives in Silicon Valley that have adopted this parenting style. So how can a parent feel empowered and balance the love of technology without causing any harm this holiday season? Here are some tips to consider. Limit Use Time: Restrict infants aged 0-2 years completely from technology, 3 to 5 years olds to no more than one hour per day, and 6 to 18 year old to 2 hours per day according to the American Academy of Pediatrics and the Canadian Society of Pediatrics. Choose Educational Games: Purchase apps that help to develop math, reading, and other developmental skills including games that encourage problem solving and strategy. Purchase Timeless Toys: Select games and toys that involve constructing, building, or creating. Toys that don’t require batteries or wifi like blocks, dolls, board games, and card games also encourage proper social skills that are neglected from too much tech time. Holiday toy buying can seem like an exercise in list checking, but taking the time to make intelligent choices about technology can also encourage play to be smart as well as simple, affordable, and healthy for your child. I hope you find these tips helpful. Have a playful day! 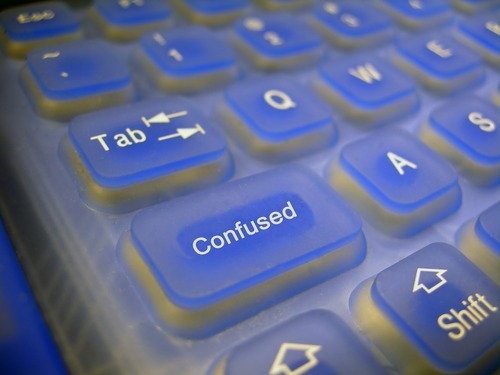 Dyslexia is a learning disability that is commonly known but poorly understood. Most people associate dyslexia with reading letters backwards, but that is only one possible symptom of many. Generally speaking, dyslexia is a specific learning disability for reading. 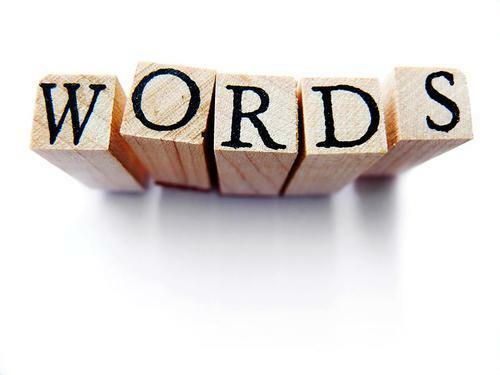 It is often characterized by difficulty with word recognition, decoding, or spelling. This can lead to difficulty with reading comprehension and could slow down vocabulary growth resulting in struggles with reading, writing, and sometimes speaking. Against popular belief, dyslexia is not caused by poor instruction, poor intelligence, laziness, or impaired vision. It is a result of a neurological condition and can also be genetic. It is also something which can be overcome with help and support leading most to good reading and writing skills overall. It is important to detect dyslexia as early as possible because reading and writing are such an integral part of learning in the classroom. Some signs of dyslexia in young children include having trouble with recognizing letters, matching letters to sounds, learning new words, learning the alphabet or numbers, rhyming words, or remembering word sequences like the days of the week. Some signs of dyslexia in older children include poor handwriting, reading or writing reversed letters like b or d, mastering spelling rules, following a set of directions, or remembering facts or rules. I hope you find this information helpful. If you feel your child may have multiple signs of dyslexia, you should consult with your doctor about having an occupational therapist or speech therapist conduct an evaluation and create a treatment plan if deemed necessary. Have a playful day! Fall is a time of year when parents are searching for balance between all the changes in their children’s daily lives. Schedules are shifted around to fit in new activities and driving routes. It also can feel like an unsettling time for children as they adapt as if they are standing on one leg. 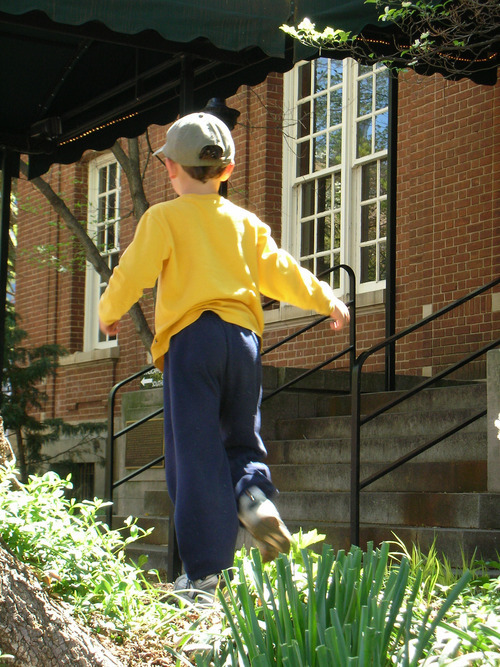 Although many parents realize that balance is important for emotional well being, they don’t often know how well a child should balance him or herself when actually standing on one leg as compared to figuratively. A simple method to determine good balance in a child is if they can stand on one foot for as many seconds as they are in age. For example, a child should be able to stand on one foot for at least four seconds if he or she is four years old. Difficulties with balance could be due to several reasons involving proper function of the eyes, ears, sensory system, muscles, joints, etc. A difference between the two legs can also be a sign of abnormalities that need to be assessed. 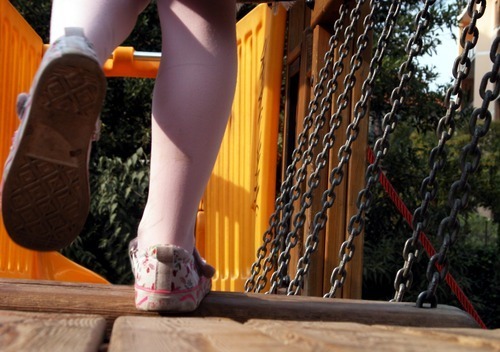 Decreased balance skills can go unnoticed and often are attributed to clumsiness but should be taken seriously and not assumed to be just a stage out of which a child will eventually grow. I hope you find this tip helpful. If your child is having difficulty with balance skills, you should consult with your doctor about having an occupational therapist or physical therapist conduct an evaluation and create a treatment plan if deemed necessary. Have a playful day! Every year millions of parents and their children head to stores with a list of required supplies for the return back to school. Every year that list includes a composition notebook. Despite the wide range of ages, this book is a standard purchase and in my book the #1 Back-to-School Blunder for Kindergarteners. Young children that are just learning to write and beginning to master their hand skills typically write large. 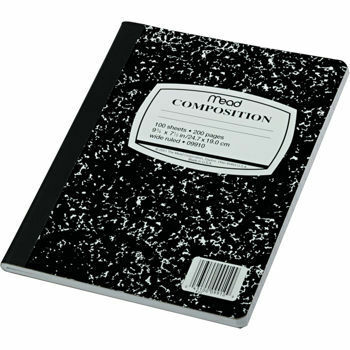 The lines of a composition book are for small writing and lead to errors in handwriting and poor habits in addition to the confusion it causes children when their other workbooks and worksheets provide large lines and more visual cues. There, however, is somewhat of a simple solution to help a child. 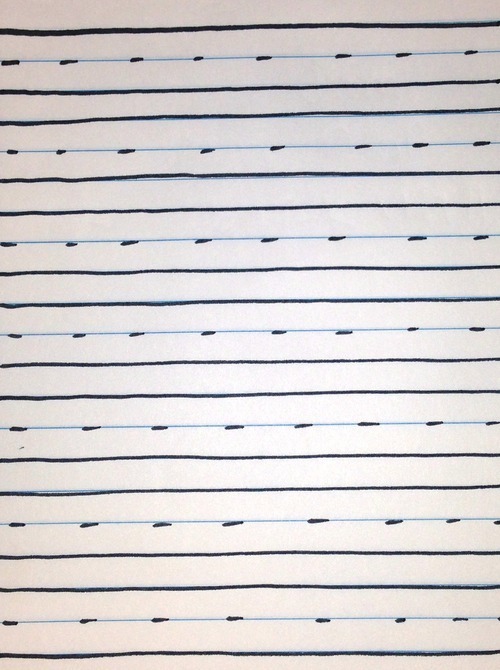 You can use a marker to create a dashed line to serve as a middle line sandwiched between two solid lines. This will create a larger space closer to the one-inch height that is more suitable for large printing. You may want to discuss this with the teacher beforehand and explain your alteration. I hope you find this tip helpful. If your child is having difficulty with handwriting skills, you should consult with your doctor about having an occupational therapist conduct an evaluation and create a treatment plan if deemed necessary. Have a playful day!